Are you a local cash (basis) grain marketing expert? If not, you need to be! I had a client call me in June (2015) and he was ecstatic to find out that his grain buyer was offering him a $.50/bushel premium for his high protein spring wheat. This was the first that I had heard of his high protein spring wheat (15% protein). I told him he absolutely could not sell his wheat for that price. He was very surprised to hear that from me as I usually don’t stop guys from selling their grain. Here is why. 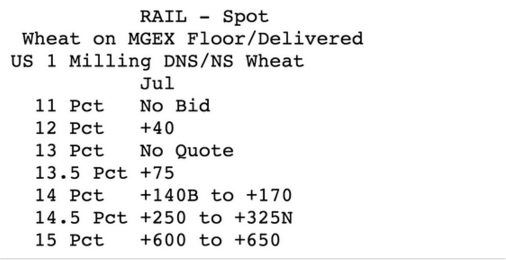 The market for high quality/high protein spring wheat had exploded higher on the rail market this winter/spring. In late June (2015), 15% protein spring wheat was trading for over a $6.00 positive basis. Yes, $6.00 over the futures price! Here are the cash bids from the Minneapolis spot market in late June (2015). Check out the bid for 15% protein! I helped the producer find an elevator that would load his wheat on rail cars and sell it for him on the spot market. When it was all said and done, he received slightly over a $10.25 cash price for his wheat in late June (after rail and handling charges). This compares to the $5.90 cash price he was told he should “jump all over” a few weeks ago. While this is definitely an anomaly, you owe it to yourself to become a local cash market expert. While these type of premiums pop up every couple years for wheat and certain specialty crops, one area of focus for a corn and soybean farmer is to be highly aware of inverted markets. Summer of 2013 corn market. Coming off of the short crop of 2012, the futures and cash markets were highly inverted between July and Sep/Dec (meaning old crop futures and cash prices were trading at a significant premium to new crop futures and cash prices). In late July, when end users switched their bids from July to Sept futures, we lost nearly $1.00 of cash price in one week while the futures stayed nearly the same. Many producers held onto their 2012 production and got hammered by this evaporation of the cash price after being offered a historically high basis only a couple weeks earlier. When the basis is trading at multi-year highs, SELL! Summer of 2014 soybean market. Due to very strong demand, the cash market for soybeans was extremely tight during the late summer of 2014 (before new crop supplies hit the market). End users, soybean meal crushers in particular, were offering premiums of up to $3.00/bushel to secure supplies in the month leading up to harvest. While most soybeans were already marketed leading up to this, the producers that held soybeans into the new crop marketing season gave up a tremendous opportunity to sell their cash soybeans for over $13/bushel. Having for your finger on the pulse of the local cash market is a job that all farmers need to accomplish. Always try to identify times where end users are paying higher prices for nearby supplies and use that as a guide to get some production sold and remember that most buyers will offer you basis contracts if the futures price doesn’t meet your objectives. It’s also important to note that becoming a local basis expert will provide the most value to you if you separate the futures and basis transactions in your marketing. Imagine that you are a producer who raises and can store 250,000 bushels of corn. You hedge your production using futures contract sales in 50,000 bushel increments. You will then be in a situation where you could potentially offer your buyer all 250,000 in one increment and you are less sensitive to where the cash price is on that day, all you care about is basis. During the fall of 2011 we in the northern corn belt had an early harvest. In early November, producers were focusing on finishing their fall field work and were hesitant to start moving grain. A local corn buyer called me looking for bushels. They had a $-.25 basis posted and I pooled a few clients’ bushels together and offered them 250,000 bushels at a $.00 basis. We got a deal done at a $-.02 for LH November delivery (approx. $-.58 better than harvest basis only six weeks earlier!) . We were able to gain $50,000 over their posted bid because we were able to identify a market that wanted corn sooner rather than later and we could get them a sizable amount of bushels. You won’t always hit the basis high of the year but you’ll lean the odds heavily in your favor if you simply track your markets. I suggest spending 30 min per week checking all your local markets and placing calls to your grain buyers to try to identify times when users are willing to pay a premium for your product. It can be a mixture of art and science at times but you owe it to your self to become good at the art of spotting premiums that should be sold. Cash grain marketing is important. Become a local cash and basis expert.